This morning’s forecast called for a high today of 29 degrees, and a low of 5. I decided to ride to work after taking much abuse from fellow commuters for skipping out from riding on Monday. The temp was about 32 degrees when I left home, so the day started out even better than I expected. Even with very little active precipitation, it was a pretty slushy day, with the weekend snow sitting around on the verge of melting. My feet ended up pretty soaked by the end of my 14-mile ride, but my wool ski socks still kept them relatively warm. I laid out all of my damp clothes at work, and everything pretty much dried out during the day, except for those socks. I had taken a spare pair of light quarter-length socks to wear around work during the day, but I figured those would not be enough to venture out in for the ride home. So, I pulled on my still-soaked ski socks, put on all the rest of my layers, and headed out. It was about 22 degrees out, so again I thought I was going to be better off than expected. I would have been better off with the lighter, but drier all-day socks. My feet were chilled within the first mile. When I got home, I could barely walk. They weren’t so much numb from the cold, but in throbbing pain. 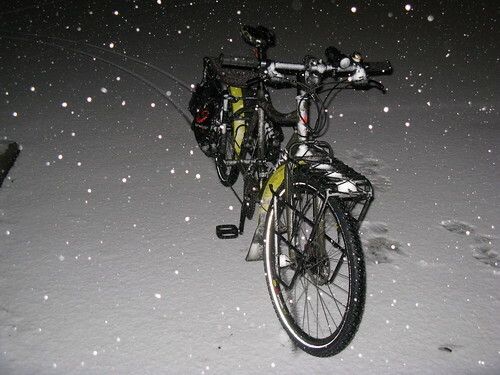 I remarked, “The good news is that if I can still feel them, I don’t have frostbite.” It turns out, that probably wasn’t the best thing to say to calm my significant other’s concerns about this whole night/winter cycling concept. I spent a few minutes on the couch with my feet wrapped in a blanket, and they are fine. So, the lesson is: pack a spare pair of warm, dry socks for the ride home. I don’t usually make New Year’s resolutions, but as my riding mileage dropped way off last month with the onset of bitter cold weather, I figured the new year would be a good excuse to start walking the walk, as well as talking the talk, especially as a co-founder of this blog. So, I began riding my bike to work yesterday. The worst part about bad-weather riding, in my opinion, is not so much being out in the weather itself. It’s the additional activity required before and after the ride: planning the additional clothing that you need to wear for the ride, and packing more clothes that you’ll have to change into once you arrive at your destination. So, advance preparation is the key more than ever to killing the motivation-killers. Get into a night-before routine–set out your riding clothes, pack your at-work clothes, and make sure your bike and gear are set up and ready to go. Speaking of bike preparation, I recently added the final touch to make my winter commuting bike ready for action. I needed a rear cargo rack. Mountain bike frames with disc brakes and no rack mounting eyelets present a challenge for carrying cargo. First, I tried mounting a standard cargo rack using clamps around the seatstays for the lower arms of the rack. It held firm, but this caused the rack to sit in a more forward position, which in turn caused my heels to hit whenever any pannier was hanging on the rack. So, I came across the Axiom Odysee Full Suspension Rack. As the name implies, this rack will work on full-suspension mountain bikes (as long as they don’t have suspension pivots on the seatstays). However, it’s the ideal solution for any bike that has disc brakes and/or lack of rack eyelets. Your rear wheel must have a standard quick release. The design principle is similar to the popular racks from Old Man Mountain, but the price is much more reasonable. The lower mounting points on the Odyssee Full Suspension Rack use elongated metal plates, with holes through which you thread your rear quick release skewer. The upper mounting points on the rack are made up of two rigid metal support brackets and a pair of clamps that attach to any point on your seatstays. The support brackets are adjustable, so you can get a level rack setup no matter what the angle of your seatstays is. Here’s what it looks like on my bike. It was an unexpected benefit that it still left room for my seatpost-mounted fender between the rack and the tire. 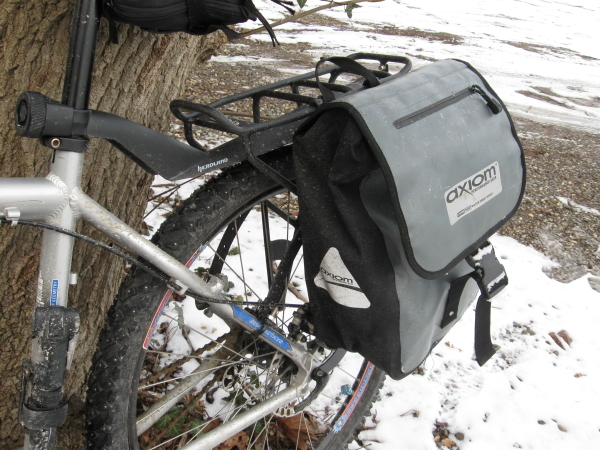 My Axiom waterproof panniers fit very well, as you would hope, leaving plenty of clearance for my size-10.5 hush puppies. I have never seen any store carry the Axiom Odyssee Full Suspension Rack, but most can special-order it for you. Ask for QBP item number RK6622; they’ll know what you mean. Suggested retail price is $46.99, which includes all the brackets, clamps, and other hardware you’ll need to make it work, and comes in any color you want, as long as it’s black. 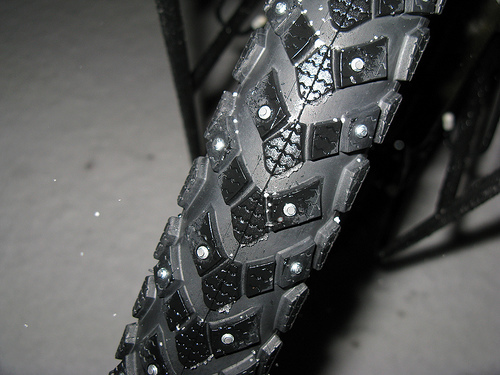 Last Monday, after much deliberation, I ordered some Schwalbe Marathon Winter studded snow tires for my bike. I’ve always just used wide knobby mountain bike tires, and I figured if I was going to commute through the winter, I would need them. I was unsure if I did the right thing by ordering the tires, then on Tuesday I wiped out in the parking lot at work in front of my boss. I did the right thing! Fast forward one week, I was eagerly waiting for the tires to arrive. UPS came and went; no tires. Well, I ended up staying later because other scheduled plans later this week, and luckily I did; the tires arrived FedEx! Of course, I immediately installed the tires. Let me start off by saying that I am a big fan of fat tires and these are not. They are 26″x1.75″, and most companies’ tires run narrow. I used a digital caliper to accurately measure them and much to my surprise, the came out to a whopping 1.77″. After work I had to run some errands, so I was more than happy to try out the new tires. I had a 3 mile ride to my stop, 2 of which were uphill. The tires were pretty noisy, which I figured they would be, since there was a couple hundred steel studs hitting the ground, but they still rolled pretty smoothly. At this point, the roads were dry. Schwalbe recommends that on dry pavement you run maximum pressure, which is 70 psi, and when it’s icy, run minimum air pressure, which is 30 psi. They also suggest 20 to 40 miles of hardpack riding to set the studs firmly in the tire. After my errand, I headed home, and I had about 8 miles to go. A mile into the ride the wind started to blow and the rain started; after another couple miles the rain tuned to sleet, which felt like I was getting sandblasted. 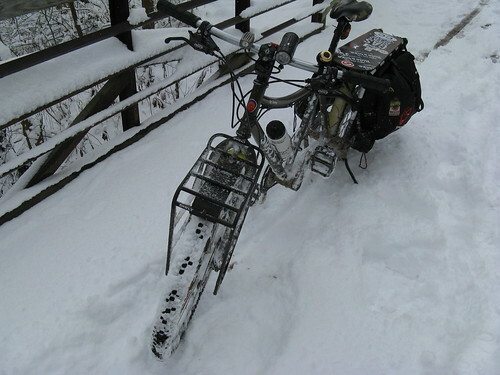 By the time I started to descend back into the valley, I was in a ful-on Ohio winter mess. 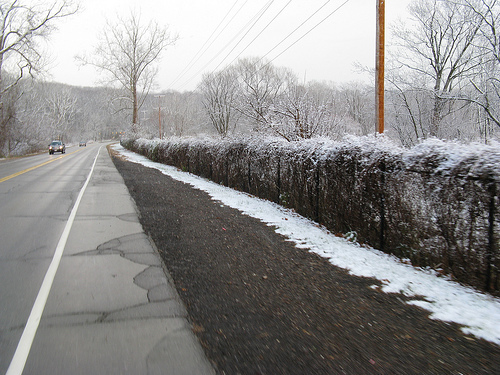 Snow was accumulating on the road, the wind was blasting, and all this over ice. Got to love winter commuting in Ohio! The descent back home wasn’t even fun; I had to ride the brakes (thank you disc brakes), then I was worried that the cars around me were going to lose control and crush me. Finally, I arrived home in one piece, and you know what? The tires never lost traction. I made a wise choice! I haven’t posted in a few days because of Turkey day, and I really have been lazy about commuting. 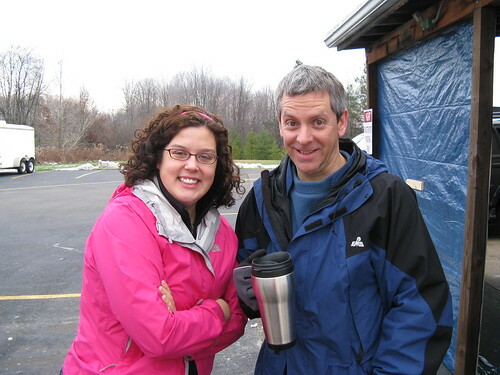 On Sunday, I got up early to go to a pancake breakfast at the Moose lodge in Cuyahoga Falls. The plan was for Kevin to ride from his house, me to ride , and Sarah to drive form our place. Well, to make a long story short, I rode, and everyone else drove. 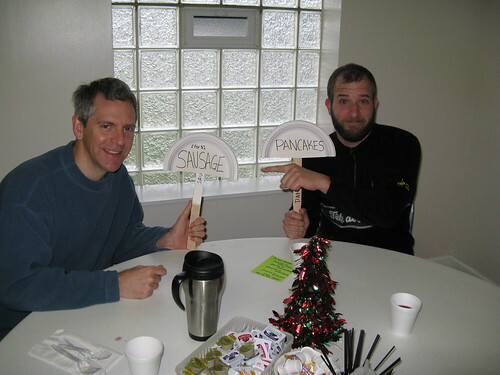 Luckily, I forgave Kevin quickly because I love pancakes, and I gave him a proper amount of harassment. 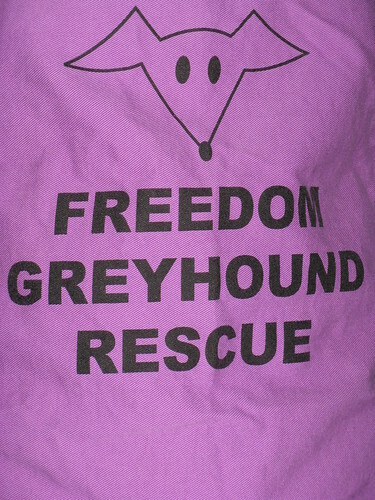 The breakfast was in benefit of the Freedom Greyhound Rescue, and I hope it was a great success because the people were extremely nice and the food was great. Since I did not ride home on Tuesday (combination of cold, wet, and lure of wings and beer), I drove in Thursday and rode the bike trail home. If you ride quite a bit, you notice and witness some weird things. Last night was one of those nights. First, as I’m riding, I hear something running in the brush next to me. It was a deer that decided it was time to cross the path, right in front of me. Well, I’m sure it was as startled as me, because wet disc brakes, are not quiet and the screeching echoed through the valley. This was actually the third or fourth time I almost hit a deer this fall. Sadly, I did not get a photo of that. 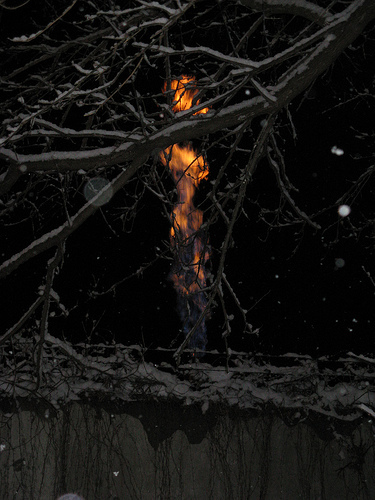 Secondly, I stopped to take some photos by the Akron Compost Facility, and I notice this flame shooting out of a pipe; some kind of gas burn off I suspect; weird, but cool! I had just never seen it before, and I ride past there all the time. Finally, as I got home, I have a hill to ride up. Well, there were cars behind me, so I got as close to the curb as I could, but there was a few inches of fresh snow, so I couldn’t get over all the way. The cars just stayed behind me, and when I made the turn in, the driver’s window must have been down, because I heard him say, “What the hell is that?” I could only assume he was wondering about my bike and why I was riding in a snowstorm. As promised yesterday, here are a few pictures from Tuesday’s commute. Enjoy! Alright, so Monday was not the horrendous multiple feet of snow that it could have been, but it did snow enough to make a interesting ride. If you haven’t commuted in cold temperatures, it’s a bit of trial and error when it comes to clothing. You have to be warm enough to stop at lights and on downhills not to freeze, but if you dress too warm, you sweat like a pig while pedaling. I rarely get it right, but I do make it tolerable. I am a huge fan of wool as a base layer. Synthetics are good also, but they tend to get a little smelly. My latest commuting wear has been, Helmet(Duh), wool cycling cap over a balaclava, wool jersey, wool long sleeve, soft shell jacket or rain jacket, cycling shorts, insulated tights, waterproof pants, wool hiking socks, waterproof hiking boots. I run platform pedals and boots, I don’t slip and slide when I go in somewhere, plus it’s just easier and more comfortable. The ride on Monday was little chilly, the temps were around 36 degrees and it was pretty wet out. The first part of my ride is about 3-3.5 miles of road, then I hop on the Towpath trail. Like I said, the road was wet and no ice. 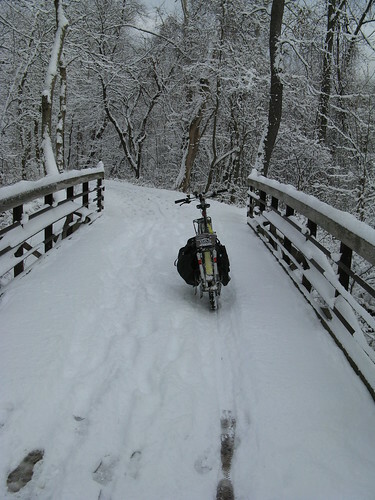 The Towpath was still warm enough that the snow was not sticking, so it was pretty sloppy. 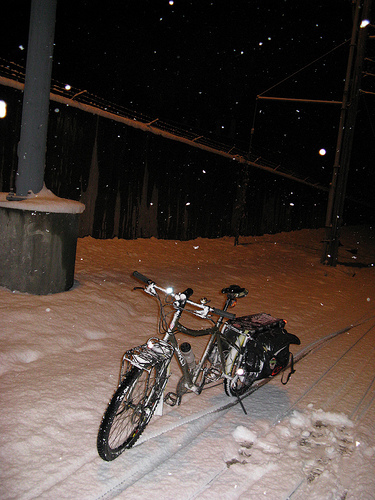 I got off at 3:00 pm so the ride home was much of the same, but a little more snow on the surrounding grassy areas. 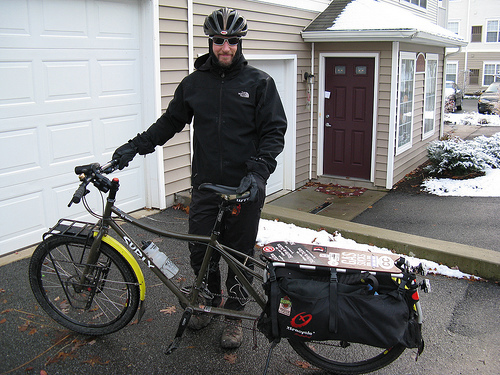 I was a good ride to test out my clothing and winter commuting set up. Stay tuned for my Tuesday report, It was an adventure!